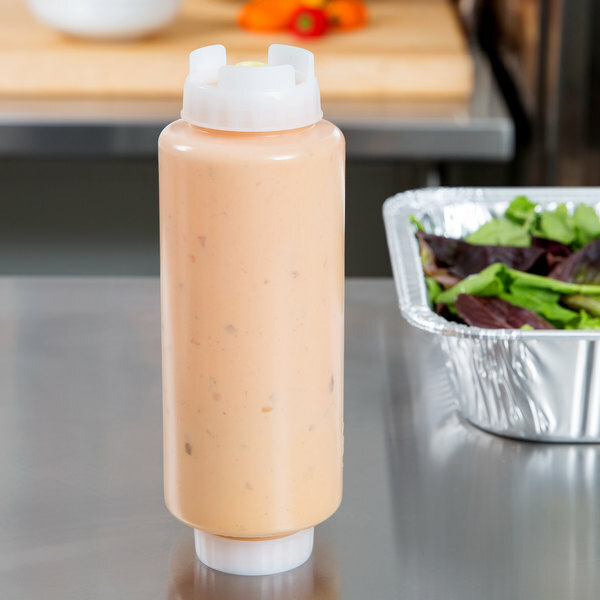 Serve condiments, sauces, and toppings with ease by using this 24 oz. multi-purpose first in, first out squeeze bottle. Its unique design works naturally with gravity to dispense downward, with a wide mouth opening at each end to allow for sanitary dispensing and quick, easy refills. 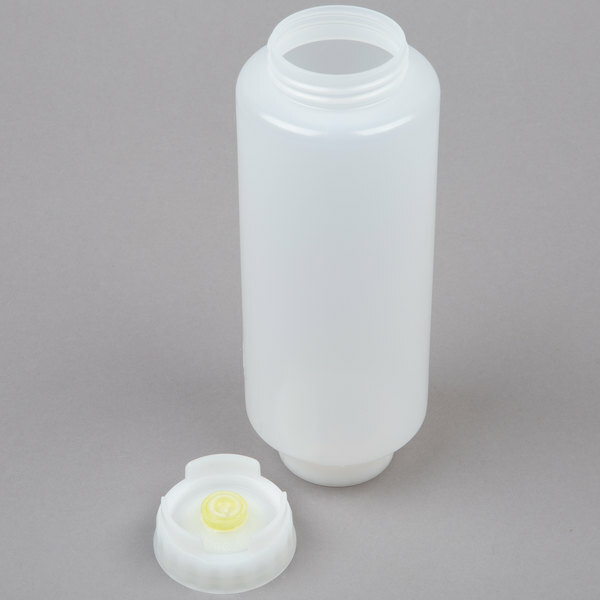 Just open the top label cap, load with your selected topping, and then pour using the convenient dispensing cap on the bottom. What you put in first comes out first, meaning no shaking, fewer stuck ingredients, and reduced waste. 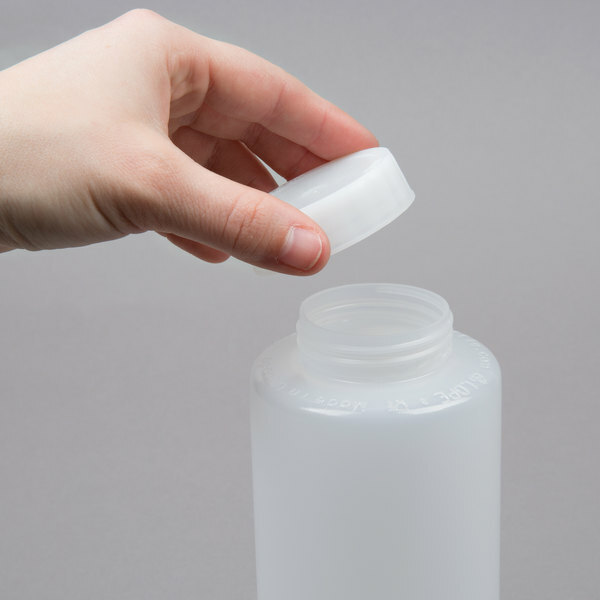 The bottle's clear, easy to label cap on top also allows for quick and easy identification of contents. 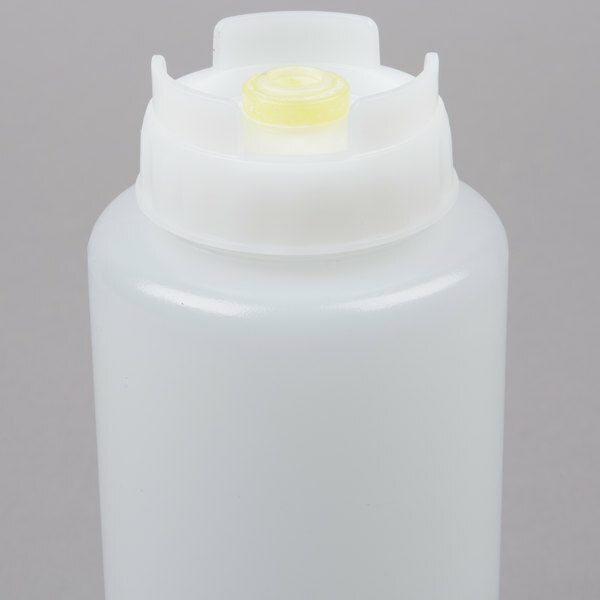 This bottle features a unique tripod stand design on the dispensing cap to give it stability while stationary. Perfect for use in sandwich shops, delis, cafes, and more. Fantastic for our pesto sauces. 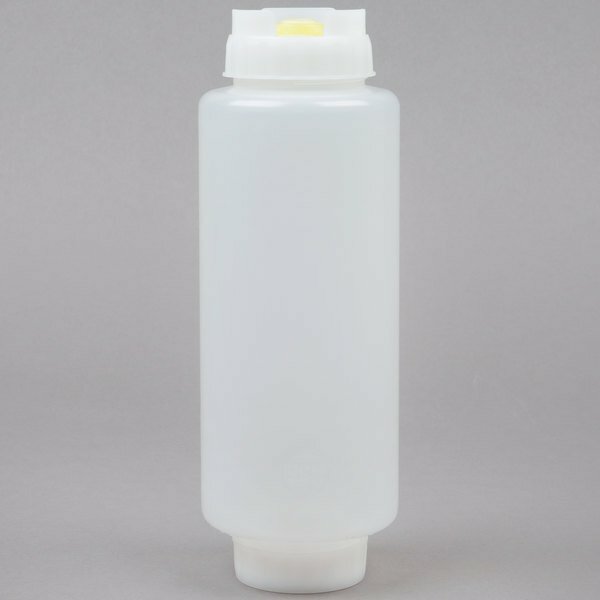 The bottle is easily cleanable and sanitized. Nice and durable. Thick plastic that doesn't feel like it is going to break. I love this squeeze bottle. They are very practical, durable, hygienic and cheaper. If you have the opportunity buy it. The fifo brand has experience in this products. These bottles are GREAT!!! They have saved us so much time. They are very easy to clean. On busy nights, we can just refill them and know the product is rotated. BEST Bottles around. I have purchased different brands of these bottles. These by far are the best. The nozzle doesn't go bad for a very long time. Last time I bought some was three years ago and just now having to replace them. What a awesome product! We use them for Sour Cream and in a rush it's so easy to refill! Originally we bought a few from a company not knowing that these were offered by webstaurant. They were too small for our needs and we are really grateful to find a larger size. This bottle is slightly above average size, so be aware when you buy it. It's perfect more heavily used sauces that you plan to make work often. These bottles are heavy duty, overall useful to have on the line. With our concept- we can portion control, easily label and keep our working areas clean. I started using this size to store and apply mayonnaise to our elotes. I had been scooping the mayo from the container each time. What a pain. And to have to wash a mayo utensil over and over. I just hate touching oily mayo. This bottle cuts down on my close contact with that wobbly substance. This work wonderful for our mayo. We are always serving fresh product! The openings on both ends make cleanup a breeze. Our health inspector loves the also! These are great! We use them to put our syrup toppings in for the froyo. Great for no leaking unless they are squeezed! We would order again when necessary! 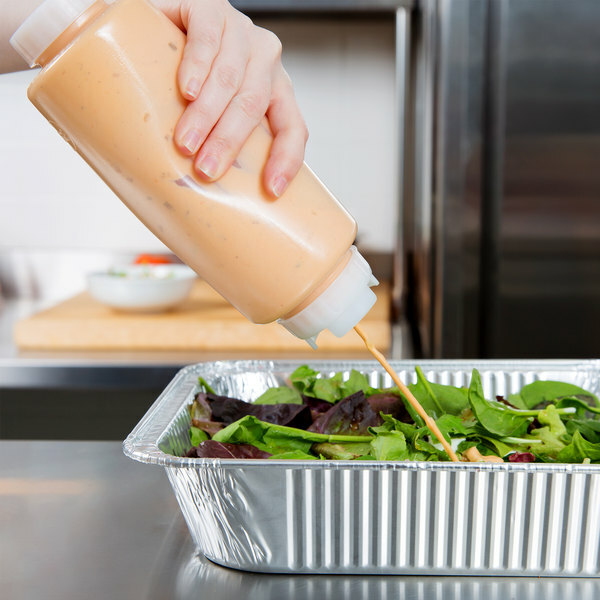 This hefty container is hefty container is ideal for the sauces and dressings you use lots of. It's also very easy to clean and to sanitize! Sir Clean like 24 oz. 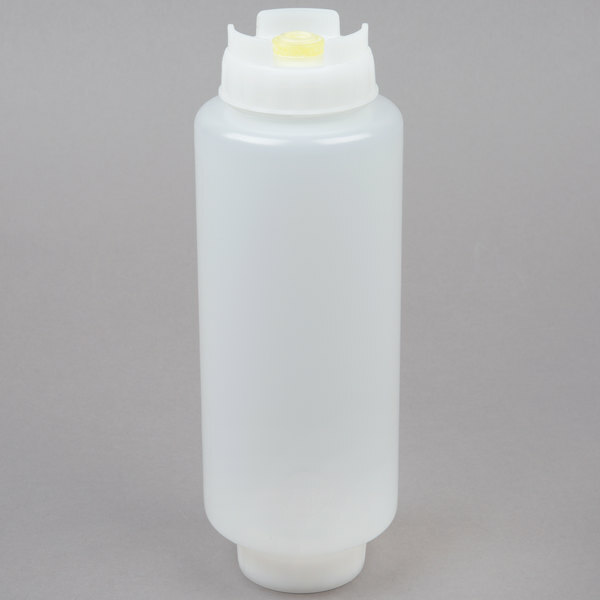 First In First Out "FIFO" Squeeze Bottle with Lid for the price and quality, we used for different purpose en our job. awww now this is a nice squeeze bottle . perfect for any dressing, product is there every time you need it. Just give a squeeze. bargain of a price. We used to use regular squeeze bottles for all of our condiments, never again! These bottles are so easy to fill and it's nice to know that you're not leaving old dressing at the bottom of the bottle! Held the 24 oz. First In First Out Squeeze Bottle with Lid upside down on the dispenser side, to see if it leaked the water from the bottle. No leak of water on my hand. Such a big container. We store syrup in these overnight and it leaked all over the place. Definitely sending these back to get a credit. Do not recomment these. Thank you for your review, Elise! We are sorry to hear that squeeze bottles did not work for you. A Customer Solutions Representative will contact you shortly to resolve this issue. We use these bottles in two different sizes and they work perfectly. We never have to worry about people dumping new sauce on top of old sauce. It's great. This smaller version is great for children and is used as a back-up ketchup container. Happy with that product will buy more if need Ed. Good bottle for dispening the oldest product first and to clean the bottle easily. I recommend keeping or at least trying some of these in specific use cases. I bought one of these to use as a pancake syrup dispenser (home use). I found they will not even hold water without leaking, let alone pancake syrup. This is in either orientation. The answer is to add "o"rings to both caps. 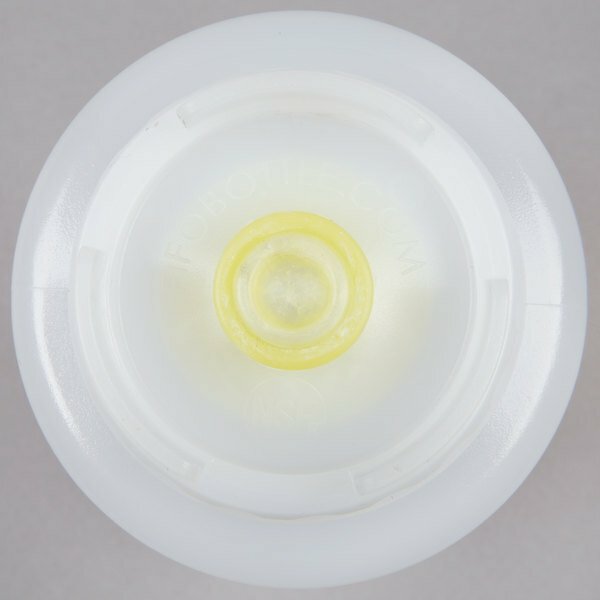 use 2 size 030 silicone O-rings in the groove of the small cap and one 032 silicone O-ring in the groove of the valve cap. I really like this thing for syrup, too bad it cost about $70 for all the plastic junk out there that leaks. You'll have to buy 25 O-rings to get one (amazon). I tried to find one without the First In First out gimmick, just the valve on top, but no joy. Store it with the valve up and enjoy. The 24 oz. FIFO squeeze bottles are great! Can't keep enough of them in the store. Very easy to use and very clean, a must have for all sauces!